Long before the pilgrims settled in Plymouth (1621), English explorer, Martin Frobisher (you may have heard about a bay named after him), arrived in Newfoundland. The year was 1578. Believe me; he was thankful to make it. His celebration marked the very first Thanksgiving in North America, close to a half century before the Pilgrims cooked a turkey in Massachusetts. The first Thanksgiving in North America was celebrated in Newfoundland in 1578. The reason Canada moved the date was influenced by the world wars. Because we celebrate Remembrance Day on November 11, it became an issue to give thanks and remember the fallen at the same time. This year, Thanksgiving is October 9 (in case you didn’t already know). So how do we differ from our American neighbours in how we give thanks? Well, one difference is that we celebrate in October, not November. Some say it’s because the American harvest happens later than ours. One other difference, research shows, is that, in the U.S., Thanksgiving is as active a celebration as Christmas in scope based on travel statistics. Apparently, more Americans travel significant distances to be with friends, relatives and family than Canadians do. Some other differences: U.S: has a 4-day weekend; Canada, a 3-day weekend; U.S. has bigger parades (Macy’s Thanksgiving Day Parade). Generally, the food is much the same. Turkey, of course, is the main course. Pumpkin pie is the traditional dessert. The dinner sides include stuffing, corn, gravy, squash, and cranberry. It is interesting to note that in the U.S., pumpkin pie is typically filled with custard and the Canadian version is spicy, with cinnamon, nutmeg and cloves. Last interesting statistic. The number of turkeys served at Thanksgiving: U.S. 242 million; Canada: 2.2 million. At the end of the day, Thanksgiving is the one time of the year we stop for a moment, to give thanks. What are you thankful for? Happy Thanksgiving from Cashco Financial. 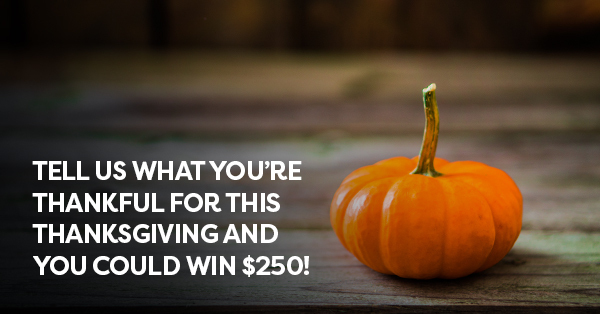 Take a minute to tell Cashco what you’re thankful for and you could win….